Apart from being one of the most well-rounded creative people I know, Elizabeth is also an incredibly gifted painter. In the last few years, while also briefly dancing alongside Elizabeth, I've been delighted to see her blossom through this other art form. I was visiting her apartment one evening and admiring her artwork scattered across the walls. She has made so many uniquely creative pieces that she's begun running out of space for them. It was before Elizabeth arrived home and I was talking to her roommate and friend, Emily who mentioned that whenever Elizabeth would paint she wouldn't look at anything, just kind of paint from her own ideas. I found this to be particularly impressive as a descriptive mountainous landscape painting caught my eye. Naturally, this was my first question for Elizabeth: how does she approach the blank canvas? "Well, the art that I've always been used to (ballet) has been pretty structured. It's told me how to do it, for how long I should do it, where I should do it. This made me feel quite stuck in this rigid way of producing art. But it's quite different with painting. I'm not so stuck in a box. I appreciate art so much, I follow a lot of photographers and artists and I enjoy going to art galleries. When I paint, I'm not exactly starting from nothing, I let all these pieces around me in my life come together and inspire me, in a not so rigid way. It's an outlet I can feel through. I don't tend to like the things I plan - I get really frustrated if I try to make something look like something else." "I really like to work with colour. I often start by mixing colours and until it becomes a really cool shade. And then I work with it and eventually it kind of turns into a...something." I find it interesting that she mentions this reliance on colour. Colour can be such an inspiring thing. It can make or break one's opinion on a piece of art. But as an artist, as in Elizabeth's case, it can also set directions. "I don't like to make anything too abrasive. Not harsh. I like to keep a lot of fragility and innocence in what I make. There's a vulnerability that comes with the journey of not knowing what I'm painting. Sometimes it's a really hard thing to not have any idea where you're going.... not just in painting, but also in life. In painting, I find I can really do that without guilt. There's a comfort in that." In Elizabeth's paintings, this softness is evident. It's delicate and real, but full of life and vitality. Much like her own character. "I grew up doing nature sketches and things like that when I was younger. Art was one of my favourite things during high school. I pursued a lot of creative classes in high school that didn't restrict me in a way ballet did. There was a time that I did fall out of touch with painting for a few years. At some point, I started to feel a little unsettled in my ballet career and felt this impetus to start painting again, to try to create something for myself and fill a void that wasn't being filled at work. I felt like I wasn't creating good art at work and I wanted to create something I could be proud of. 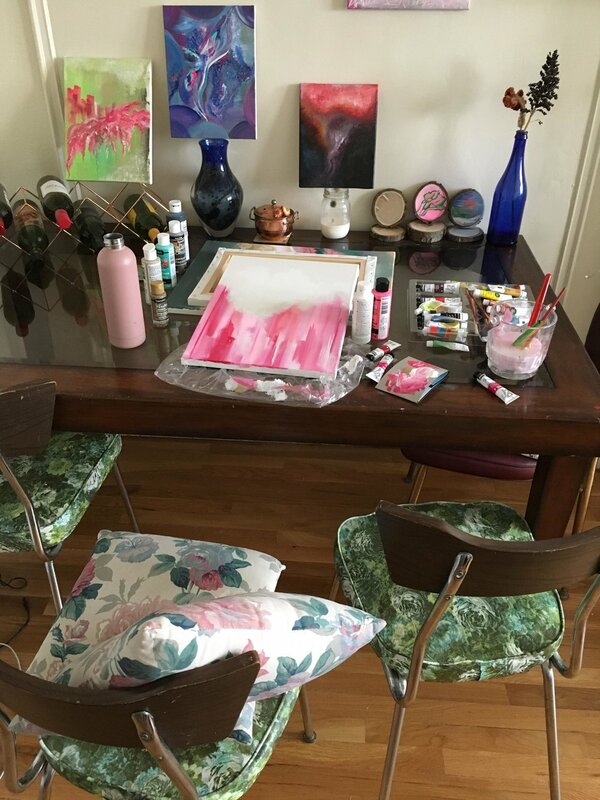 It was frustrating when I wouldn't be able to find the time to do that because eventually this alternate creative outlet turned into my art therapy." "It seemed sort of like a "why not" kind of thing. I had the time to devote to it and painting has been something I've done only for me for so long. I felt that if someone else would be interested in seeing my work, that would be really nice. Some of my other artist friends showcased their work at Pancakes & Booze before and have mentioned it to be a good platform, so I thought I would apply. I got accepted and I was there and it happened and it was cool. Previously, friends would always tell me nice things about my artwork but to have strangers at the event compliment me was this sort of affirmation that I could actually do this and do it well." "Yeah, absolutely. Because it comes from such a vulnerable place and it captures my own feelings of that day. To be able to share my work and receive feedback - it is like performing. It's this high after the audience claps at the end of a show. There's something magical about it and it fuels you." "It's nice to work on something and be proud of the final product. On stage you're giving it to the audience, giving your all, and then it's gone with one go. But with painting you have more opportunity to mould it into something you're proud of and then let it go. I almost feel like, for me at least, painting is something more personal. I can shape how it's viewed and how I want the audience to see it. This is kind of funny because I've been saying ballet tends to keep you in a box and that painting is less restrictive but now I'm saying that I still like to be a bit of a perfectionist with my paintings. I'm kind of contradicting myself, but ultimately it's about this balance. And the ability to be in control of the painting and how you want it to look. It's on your own terms. "And in both art forms, you're just wanting to do a good job. You want to put in the effort and have the best outcome possible." What's next for Elizabeth? Currently, one of her pieces is being auctioned online through Waddington's. On May 1st, there will be a preview reception for the works being sold. All profits made will go to the Seventh Stage Theatre Productions, a theatre company made by women and made for women and their activism. "It can be interpreted however one would like. I never really know where the painting is going so I can't really label what it's supposed to be. Each person will see something different in the painting, so it can really be anything."